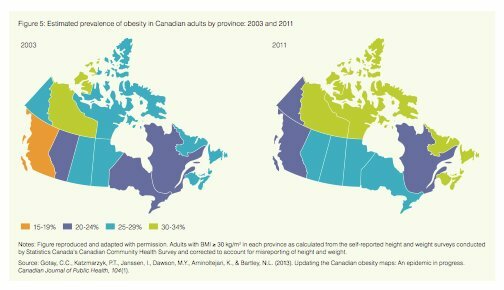 Obesity rates rise – will Ontario implement the recommendations of its own panel? Obsesity is on the rise in Canada. From the Health Council of Canada Progress Report 2013. Health prevention is one of those hands down winners. You ask people about health care reform, and almost everyone believes that moving health issues upstream has the potential to reduce costs for the health system. In the Health Council of Canada’s progress report for 2013, they note that when it comes to public health, we have too few objectives and measures to evaluate our successes or failures. No kidding. Health promotion was supposed to be a key narrative in the health accord signed between the provinces and federal government in 2004. That accord is about to expire in October of next year. One measure they do have is the prevalence of obesity. Clearly obesity is a major factor for public health, yet the results between 2003 and 2011 are disastrous. Almost every province and territory has seen a rise in obesity. Only the Yukon saw a decline. Obesity can lead to higher blood pressure, diabetes, and an increase in the prevalence of hip fractures. It can also contribute to issues around depression and self-esteem. In Canada obesity is also equated to income inequality. Low incomes Canadians have less access to quality fresh food and exercise. Studies have shown a higher prevalence of fast food restaurants in low income neighborhoods and a lower prevalence of recreational facilities in these same areas. One U.S. study noted that counties with poverty rates of more than 35 per cent have obesity rates 145 per cent greater than more affluent counties. According to a recent Conference Board of Canada report Canada’s child poverty rate has increased to 15.1 per cent from 12.8 per cent in the mid-1990s. Is it any wonder that Ontario Health Minister Deb Matthews made childhood obesity part of Ontario’s remarkably thin health action plan? In that plan, the government has set a target to reduce childhood obesity by 20 per cent over five years, yet there has been no word on whether they will implement the recommendations of their own expert panel on this issue. Given the evidence around obesity and poverty, clearly the province also needs to play a role in a broader discussion around bringing down rising levels of inequality in Canada. That could begin by increasing taxes on the wealthy to pay for more playgrounds and recreational facilities for kids in disadvantaged neighbourhoods. It could also do more around education and labeling of fast food. Last year the NDP introduced a bill into the provincial parliament requiring calorie counts to be posted in chain restaurants with five or more locations and revenues in excess of $5 million. The bill died when Dalton McGuinty prorogued parliament. Numerous municipalities in the U.S. have already introduced such rules. Another study in the U.S. suggests posting the exercise required to burn off food items would have an even greater effect. While the NDP bill died, the recommendation has come back again in the February report by the panel on child obesity convened by the Health Minister. In fact they have gone much further, including banning the marketing of high-calorie, low-nutrient foods, beverages and snacks to children under age 12. They also call for a budget of $80 million to turn their recommendations into reality — a figure that wasn’t specifically earmarked in the May budget. While combating obesity may require up front resources, the payoff on the downstream effects on health care would be tremendous. 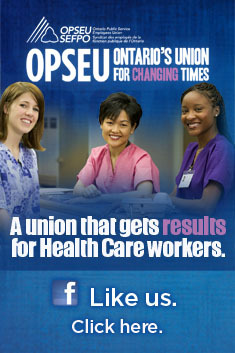 The Ontario government’s own panel estimates the cost of obesity on the health system to be $4.5 billion annually. Will the government actually find the courage to act? The May budget was oddly non-committal, simply noting the recommendations were released as if simply making the recommendations would be enough. Clearly, that won’t be enough. Recently a nine-year old girl attended a MacDonald’s shareholder meeting and accused the company of “tricking kids” into eating junk food. One of those tricks the nine-year-old didn’t raise was the fact that the “healthy” salads — which are a poor performer for the restaurant chain — have equivalent calories and fat to a Big Mac, and in the case of the Caesar, much more. To see the story and hear the child’s comments at the MacDonald’s shareholder meeting, click here. This entry was posted in Uncategorized and tagged Health Council of Canada, Health promotion, obesity, Panel on Child Obesity. Bookmark the permalink.